Soon to be the Elizabeth Tower? 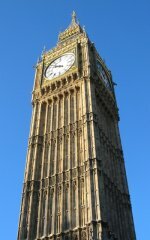 It has been reported that most MPs are in favour of renaming the clock tower of the Palace of Westminster as the Elizabeth Tower in honour of Her Majesty the Queen, on the occasion of her Diamond Jubilee. The large square tower at the other end of the building was renamed the Victoria Tower to mark Queen Victoria’s Diamond Jubilee. No other monarchs have reached 60 years on the throne. I think that’s a fairly good idea, even if I doubt many people will use the new name. The tower is almost universally known as Big Ben, although strictly speaking that is the name of the largest bell it contains, which strikes the hour. Many people believe the official name of the tower is St Stephen’s Tower. I must admit that for much of my childhood and until fairly recently, I also believe this to be the case thanks to the film The Thirty Nine Steps , the ’70s version starring Robert Powell. The climax of the film takes place in the tower, and as they enter a door at the base, there is a sign saying “St Stephen’s Tower”. In fact, the official name of the tower is simply The Clock Tower. St Stephen’s Tower is the name given to the main entrance of the building, which is hardly a tower at all. Given the rather unimaginative name, it’s hardly surprising that most people prefer to call the tower Big Ben. While I doubt people will switch to calling it the Elizabeth Tower, at least this name may finally displace St Stephen’s Tower as what people think the “proper” name for it is. After 50 years, different sources disagree on the correct names given to anniversaries. “Diamond” is sometimes taken to mean 75 years. It appears it only became popular for Diamond to refer to 60 years when Queen Victoria reached that milestone. At the time, no-one imagined another monarch would reign for that long, let alone exceed it significantly. This time, it seems perfectly possible that the Queen could reach her 70th year on the throne in 2022. If that happens – and I certainly hope it will – the celebration could be designated the Queen’s Platinum Jubilee. I think the books agree more closely on platinum being for 70 years, but that would not matter anyway. As far as Jubilees go, we are entering uncharted territory, so following the precedent of Victoria’s Diamond Jubilee, we can call them whatever we like! I would like to see us get that far. I quite like the sound of “Iridium Jubilee” myself!